Bucket elevator conveyors move dry product or solid product to a high level. The conveyor takes the product at a low level and carries it to a high level in a bucket. At the top of the conveyor, the bucket rotates over and dumps the product out. The bucket then travels down the back side of the frame to be filled again. A bucket elevator has two chains which carry the buckets. The buckets are closely spaced together allowing for a nearly continuous flow of product. Whiz Lifter, Z style bucket elevator. Number of lbs of product per hour – depending on materials and application. Equipped with white plastic product buckets with inside dimensions of 4" long x 8" wide x 2" deep and has 36" long horizontal floor run with a 13" in feed height to 90" vertical lift with a 13" wide frame, to 96" overhead horizontal top run and has 5" x 5" discharge funnel with a 95" discharge height. Powered by a 0.33 HP side mounted motor drive. Mounted on heavy duty base frame. Whiz Lifter, Z style bucket elevator. Number of lbs of product per hour – depending on materials and application. Equipped with white plastic product buckets with inside dimensions of 4" long x 8" wide x 2" deep and has 36" long horizontal floor run with a 13" in feed height to " vertical lift with a 13" wide frame, to 96" overhead horizontal top run and has 5" x 5" discharge funnel with a 95" discharge height. Powered by a 0.33 HP side mounted motor drive with a variable speed controller. Mounted on heavy duty base frame. Whiz Lifter, Z style bucket elevator. Number of lbs of product per hour – depending on materials and application. Equipped with white plastic product buckets with inside dimensions of 8" long x 4" wide x 2" deep and has 36" long horizontal floor run with a 13" in feed height to 90" vertical lift with a 13" wide frame, to 96" overhead horizontal top run and has 5" x 5" discharge funnel with a 95" discharge height. Powered by a 0.33 HP side mounted motor drive with a variable speed controller. Mounted on heavy duty base frame. Stainless steel, Z style bucket elevator. Number of lbs of product per hour – depending on materials and application. Equipped with white flexlink belt with inside dimensions of 11" long x 3" wide x 2" deep, set on 6" centers, has 48" long horizontal floor run with a 18" in-feed height to 102" vertical lift with a 11½" wide frame, to 55" overhead horizontal top run and a 136" discharge height. Powered by a 1 Hp side mounted motor drive with on/off switch. Mounted on stainless steel base frame. Stainless steel, Z style bucket elevator. Number of lbs of product per hour – depending on materials and application. Equipped with white flexlink belt with inside dimensions of 11" long x 3" wide x 2" deep, set on 6" centers, has 70" long horizontal floor run with a 19" in-feed height to 82" vertical lift with a 11½" wide frame, to 64" overhead horizontal top run and a 105" discharge height. Powered by a 1 Hp side mounted motor drive with on/off switch. Mounted on stainless steel base frame. Stainless steel, Z style bucket elevator. Number of lbs of product per hour – depending on materials and application. Equipped with white flexlink belt with inside dimensions of 11" long x 3" wide x 2" deep, set on 6" centers, has 29" long horizontal floor run with a 25½" in-feed height to 168" vertical lift with a 11½" wide frame, to 35" overhead horizontal top run and a 200" discharge height. Powered by a 1 Hp side mounted motor drive with on/off switch. Mounted on stainless steel base frame. Stainless steel, Z style bucket elevator. Number of lbs of product per hour – depending on materials and application. Equipped with white flexlink belt with inside dimensions of 11" long x 3" wide x 2" deep, set on 6" centers, has 72" long horizontal floor run with a 17" in-feed height to 122" vertical lift with a 11½" wide frame, to 72" overhead horizontal top run and has 8" x 9½" discharge funnel with a 144" discharge height. Powered by a 1 Hp side mounted motor drive with on/off switch. Mounted on stainless steel frame. Meyer, Model PA-452-18-S, Z style bucket elevator. Number of lbs of product per minute – depending on materials, application and machine configuration. 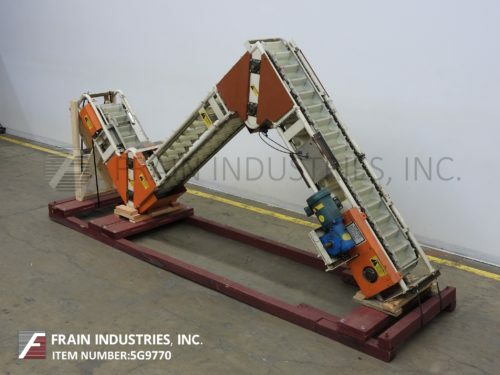 Equipped with white plastic product buckets with inside dimensions of 18" long x 5" wide x 2-3/4" deep and has 58" long horizontal floor run with a 18" in feed height to 180" vertical lift with a 16" wide frame, to 83" overhead horizontal top run and has an open end 185" discharge height. Powered by a ½ HP top mounted motor drive. Meyer Conveyor Bucket Elevator "Z"
Meyer, Z style bucket elevator. Number of lbs of product per minute – depending on materials, application and machine configuration. Equipped with white plastic product buckets with inside dimensions of 9" long x 4½" wide x 2½" deep and has 32" long horizontal floor run with a 23" in feed height to 117" vertical lift with a 16" wide frame, to 93" overhead horizontal top run and has an open end 125" discharge height. Powered by a 1 HP top mounted motor drive.